Eyewear consists of items and accessories used to aid in vision correction, cosmetic enhancement and protection of the eyes. These products are worn to correct and alleviate refractive errors. Eyewear market covers all the products worn on or over the eyes with the aim to improve the quality of life of patients. Rising prevalence of acute myopia at younger ages, rapid modernization in urban areas and rising consciousness about eye health conditions across the world is anticipated to drive the growth of the eye market during the forecast period. Moreover, rise in percentage of population who can afford luxury goods, and increasing disposable income are major driving force for the expansion of the eyewear market. The global eyewear market was valued at US$ 132,708.54 Mn in 2016 and is forecasted to expand at a CAGR of 8.30 % from 2017 to 2025.It is estimated to reach a value of US$ 265,414.36 Mn by 2025. The global eye market has been segmented on the basis of product type, distribution and geography. On the basis of product type, the market is segmented into Spectacles, Contact Lenses and Sunglasses. Spectacles has been further sub-divided into Spectacle Lenses and Spectacle Frames. Contact Lenses can be sub-segmented into Soft Contact Lenses and Rigid Contact Lenses. On the basis of Sunglasses, the market is segmented into Polarized Sunglasses and Non-Polarized Sunglasses. The global eyewear market by Sunglasses is expected to be attractive for polarized sunglasses during the forecast period. In terms of distribution, the market is classified into online channel and offline channel. Offline channel was the largest segment of the eyewear market in 2016. Online channel segment is expected to grow rapidly during the forecast period due to strong distribution network. According to geography, the market is segmented into five regions namely North America, Europe, Asia Pacific, Middle East and Africa and South America. North America currently holds the lead in the global eyewear market. The high disposable income of people in the region has aided toward the market’s growth in North America. Also the market is likely witness lucrative prospects in Europe during the course of the forecast period. While eyewear is mostly available with a higher price tag in developed economies, the fondness of consumers toward procuring premium commodities is supporting the market’s growth. Asia Pacific led the eyewear market in 2016 and is expected to grow at a CAGR of 9.21 % throughout the forecast period from 2017 to 2025. The primary drivers for the growth of eyewear market in Asia Pacific region are higher GDP rate, consumer demographics, and preference for luxury brand. Middle East & Africa are also anticipated to grow at a higher rate during the forecast period due to the rise in mall based eyewear stores and increasing impact of ecommerce players in consumer buying behavior. Over the last few years, organizations have changed their business models in order to incorporate the changes in demand and regulations. Major companies are focusing on product innovation and acquisitions along with partnerships to expand their business. Major eye market players profiled in the report include Luxottica Group S.p.A., Essilor International, Zeiss International, Johnson & Johnson Vision Care, Inc., Bausch & Lomb Inc., Marchon Eyewear, Inc., Fielmann AG, HOYA Corporation, De Rigo S.p.A and Zeiss International. This report on the global eyewear market provides analysis for the period 2015–2025, wherein 2016 is the base year and the period from 2017 to 2025 is the forecast period. Data of 2015 has been included as historical information. The report covers market dynamics including drivers, restraints, and opportunities expected to influence the global eyewear market growth during the forecasted period. Global and regional trends that are playing a major role in driving the global eyewear market have also been covered in the study. The study provides a comprehensive analysis on market growth throughout the above forecast period in terms of revenue estimates (in US$ Mn) and volume estimates (in Mn units), across different geographies. The eyewear market has been segmented on the basis of product type, distribution channel and geography. Based on product type, the market has been further classified into spectacles, contact lenses and sunglasses. Spectacle Lenses and Spectacle Frames are the sub segment of spectacles. Contact lenses is further segmented into Soft Contact Lenses and Rigid Contact Lenses. On the basis of distribution channel, the eyewear market is classified into Online Channel and Offline Channel. 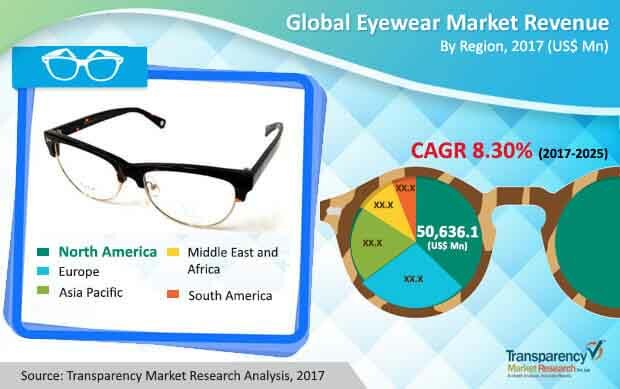 Geographically, the report classifies the global eyewear market into North America, Europe, Asia Pacific (APAC), Middle East & Africa (MEA) and South America. The regions are analyzed in terms of revenue and volume generation. Furthermore, region wise prominent countries covered in the report include the following - U.S, Canada, U.K., Germany, Italy, France, China, Japan, India, GCC countries, South Africa and Brazil. The report also includes industrial evolution in the eyewear market. We have provided the Porter’s Five Forces analysis which identifies bargaining power of suppliers and buyers, threat from new entrant, threat from substitute and threat from competition in eyewear market. Value chain analysis which identifies the key stake holders in the eyewear market is also covered in the report. Furthermore, policies and regulations aiding the eyewear market are also covered. The report also covers market attractiveness analysis and market positioning of key players for all regions covered in the scope of study. Market attractiveness analysis identifies and compares different segment’s attractiveness in the market on the basis of CAGR and market share index across North America, Europe, Asia Pacific, Middle East & Africa (MEA), and South America. The report also includes competition landscape which includes competition matrix, market share analysis of major players in the global eyewear market based on their 2016 revenues. Competition matrix benchmarks leading players on the basis of their capabilities and potential to grow. Factors like market positioning, product offerings and R&D focus are attributed to company’s capabilities. Factors including top line growth, market share, segment growth, infrastructure facilities and future outlook are attributed to company’s potential to grow. Company profiling includes company overview, major business strategies adopted, SWOT analysis and market revenues for year 2014 to 2016. The major players profiled in the global eyewear market include Luxottica Group S.p.A., Essilor International, Zeiss International, Johnson & Johnson Vision Care, Inc., Bausch & Lomb Inc., Marchon Eyewear, Inc., Fielmann AG, HOYA Corporation, De Rigo S.p.A and Zeiss International.